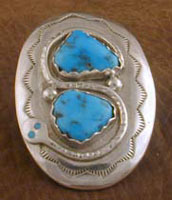 Effie SS Turquoise Belt Buckle. JEB006 Effie Belt Buckle Turquoise and Coral with Coral eyes by Artist Effie C. Calavaza. Measurements 2 1/2" W x 1 7/8" H.
JEB007 Effie Belt Buckle Turquoise by Artist Effie C. Calavaza, Measurements 3" W x 2" L.
JEB008 Effie Belt Buckle featuring Coral Artist:Effie "C" Calavaza Measurements 3" W x 2" L.
Effie Money Clip Coral and Turquoise with Turq eyes. JEM001 Effie Money Clip Coral and Turquoise with Turq eyes by Artist Effie C. Calavaza. 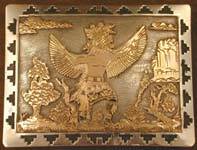 Measurements 1-3/4"Lx3/4"W.
SS & Gold Belt Buckle.